I am in possession of some free cheese. Well it’s not exactly free. It’s cheese that was provided to various charities and organisations in Ireland to distribute to those in need on behalf of the EU Food Aid programme. Yes, that’s right, Ireland receives food aid aimed at families at risk of poverty. A friend gave me some of the cheese they’d been donated, which was very kind of them considering its monetary and nutritional value. It’s a hunk (from a larger block) of plain, undyed cheddar and it’s not particularly strong tasting. In fact it tastes perfectly normal, like a decent hunk of cheese, nothing remarkable about it but that’s okay too. This cheese is free, providing you declare your financial hardship, and so frees up the household budget to buy other essentials. Manufactured at a time of surplus in the EU, remember the days of the butter mountain & milk-lake? Now the surplus is given to a number of charities and organisations who give it families at their discretion. I’m not talking about a block of cheese here or there when a family is struggling. I’m talking about buckets of the stuff, the EU has provided €2.6 million of Food Aid to Ireland in 2013. Now this surplus is running out. Free dairy items is not a new concept in Ireland, there was a time when you would receive butter vouchers from Social Welfare, but these vouchers were discontinued over a decade ago (if not more). As I discovered via North South Food this week, UK recipients of food aid have theirs restricted to only enough food for 9 days of the year. This is unlike the situation in the Republic of Ireland where it is regulated mainly by the charity sector. The motto of the Capuchin Day Centre is “No One Goes Hungry”. Cork Penny Dinners say “We Never Judge, We Serve”. There are numerous other organisations involved in the provision of food aid in Ireland and these also include (but are not limited to) Crosscare and The Society of St Vincent de Paul. 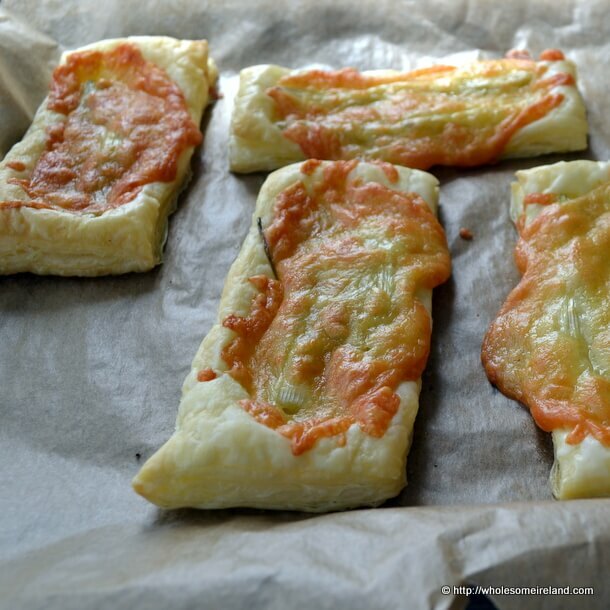 My friend challenged me to come up with a quick and simple way of using the cheese that didn’t involve putting it on toast (my favourite method of eating cheddar). Their point being that financial stress and a lack of real food choices when it comes to shopping on a budget can restrict your options. It’s hard to come up with new ideas for the same ingredients, week in week out. While we don’t receive food aid I do understand completely their sentiment. The less money you have to spend on essentials, the more you have an illusion of choice. Most weeks I buy the same items, week in week out because they are cheap, frugal and will feed the family on this tight budget we stick to. The idea that families across Ireland (3 out of every 20 families) are experiencing food poverty and have to consider asking for help is something that may not sit easily with some. Those who do admit to eating cheap food (such as burgers) open themselves to ridicule. The families that I know who do receive food aid rarely mention it. Asking for help with the most basic of necessities is embarrassing and most treat it as a shameful act. So I bought a roll of ready made puff pastry in Lidl for 94c, you can find them in the chiller cabinet near the milk and butter. It was more than enough to feed the full family, in fact it made far more than I’ve pictured here. Then I used some fresh scallions (spring onions) from our allotment (although they are in season and extremely cheap at the moment) and some the “free” cheese. If our tomatoes were more ripe I’d have added some slices to the pastry. Even if you had to pay for the cheese element you’d still be serving up a very frugal breakfast or lunch. I started by cleaning and trimming the scallions and lining 2 big baking trays with baking parchment. Then I cut the pastry into thick slices and laid the slices out, well spaced, on the baking trays. Use a fork to prick some holes down the middle of the pastry to stop it from rising too much in the middle. 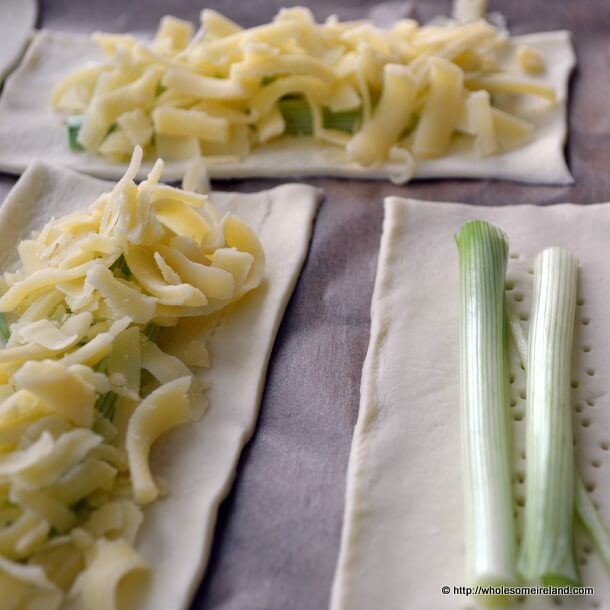 Lay 2 pieces of scallion down the middle of each pastry slab, and a generous grating of the cheese on top. Bake in the oven for 20 minutes, or until golden brown on top and at the sides. Serve with a salad and a dab of relish. Please Note: Far from my friend being an unworthy recipient of food aid, they insisted on exchanging the cheese with me for some baked goods. There is no shame in accepting food aid. We’ve got the free cheese in work for the past few summers, I thought it was pretty good as far as a mass processed product can be, better than a lot we can buy in the shop. It’s gone a long way, we have a great cook so there’s been cheese toasties, quiches, baked potatoes, you name it! I’ll pass this recipe on to her. The big question I have though is, what are they doing with the wine lakes? As a habitue of my local St v de P charity shop, I was given a chunk of this – very welcome! – cheese. I was pleasantly surprised at how good it was. We used a lot in pasta bakes and these Spinach & Ricotta Balls. You’re the 3rd person who has mentioned that they acquired it without having to make a case for it! Very interesting to see how it is distributed. I have found it a very nice piece of cheese! Hi Catriona, I follow your blog with interest and I would like to make two observations, please take them lightly! 🙂 First point is that I think you cheated a little, because this is essentially a posh cheese on toast! 😀 The other point is a question… was this an experiment or does your friend receive more cheese than she really needs? I come from a place where hunger and hardship is unfortunately very common, it astonishes me to think people here in Ireland struggle as well, your blog is very down to earth and real, but also very uplifting I must say! Hope you’re enjoying the summer and that your tomatoes ripe soon! Hi Liana. Thanks for dropping by! Secondly yes, my friend is genuinely in need of food aid. Nutritional poverty is a big issue in Ireland along with hardship & a lack of means or many families. Sorry – disqus is acting up today. My friend insisted on exchanging something for some treats I’d baked. Over 1,000 food parcels are handed out some weeks at the Capuchin Mission in Dublin. It’s amazing how in a land of plenty so many people go hungry. I think that the UK may have similar food aid though so I wonder where the cheese & rice ends up? Personally I find eggs to be far better for frugal eating! And thank you for being such an inspiration.